Waistband range: 25" - 58" - This waistband is awesome! It not only accommodates a huge range of size, but it is really easy to adjust. 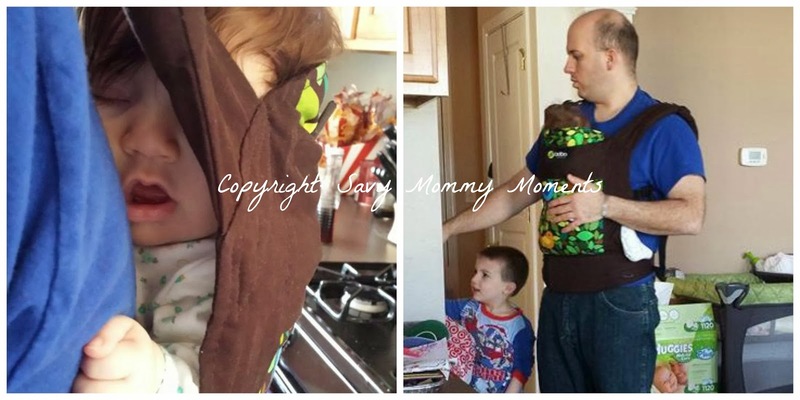 I have never had a carrier that is so easy to adjust in the waist. 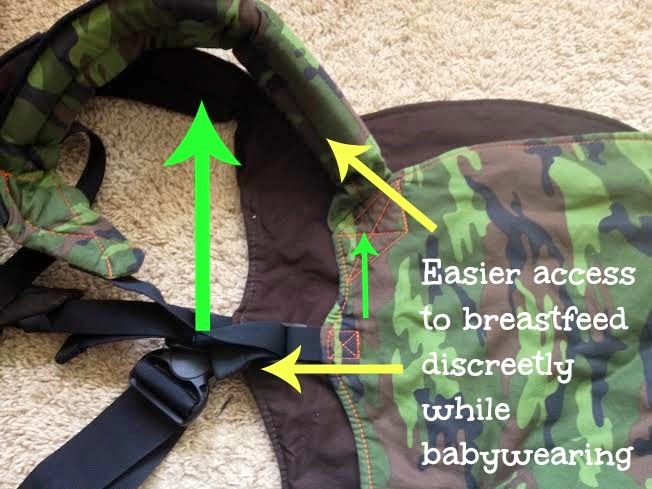 Additional adjustment for easier fit breastfeeding - This carrier has all the standard adjustment straps you find in most carriers, but there is also one additional set. These are on the sides and allow you to easily adjust the carrier a slight amount to bring the baby further away or closer to you for nursing. I personally found these to work well for that purpose and they are fairly easy to operate with one hand. Removable foot straps - Since I am using this for a newborn/infant, I didn't get a chance to test out the foot straps, but they definitely look to be very useful for older children. I did try out how they snap on/off and it was extremely easy and only required one hand to operate! Elastic bands neatly roll up straps - This is a cool feature. It's not a necessity, but it is nice to not have the straps hanging down all over the place. You just roll it up with elastic bands and it stays in place while you wear your baby around. Shoulder strap holders keep purse in place - Although I'm not big on carrying purses, I did actually try this feature out. I was in the return line at one of our local stores and I was holding my return merchandise in one hand and needed to find my credit card with the other. This strap held my purse in place so it didn't fall to the ground while I rustled all around trying to blindly find the card. I was really impressed that they thought of this feature! Easily adjustable chest strap - This strap goes behind your upper back/shoulder blades to provide maximum support and security when carrying your little one. It is extremely easy to adjust with just one hand and slides up and down to get the correct fit on your back. Uniquely designed to "hug" your child - Baby L. really loves this carrier! Once she is in it, she immediately goes to sleep. 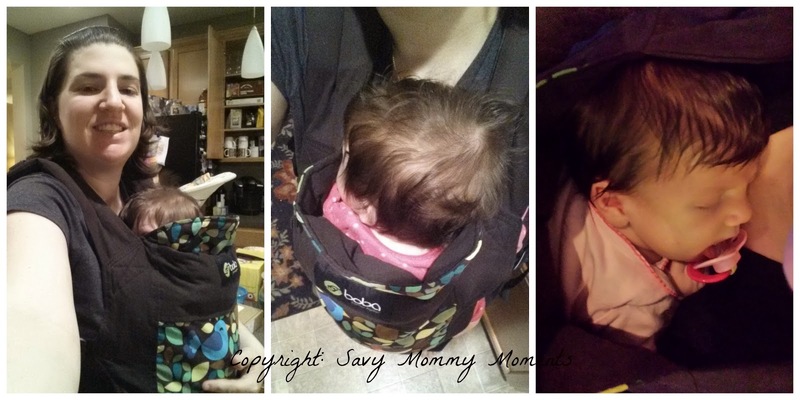 During her first few months this was a lifesaver because she wanted to be "hugged" all the time and with two young siblings running around the house, we needed a handsfree way to help them and carry her. This is definitely the answer and she loves her Boba 4G "hugs"! Includes Integrated Infant Insert - One of the frustrating things for me is spending money on a product for my babies but then having to buy an extra piece so that they can actually use it for the first few months. So, I was thrilled that the 4G now includes the integrated infant insert. It's such a cool insert as it is adjustable depending on your child's age, height and weight. There is one adjustment for tiny newborns and another for infants that are a few months+ old or bigger than average. Body of carrier rises 2"-3" higher than other brands - This feature is really nice because my kids tend to have taller torsos and really short legs. With the higher rise, they are provided the right support and I don't have to worry about their safety! Multiple pockets for on-the-go storage - It's nice that they have included some storage on this carrier. I found that it's good for putting some cash or my phone in it. I have a Galaxy S4 and it's a bit of a tight fit (with a case on it), but it still fits and it's easy to reach. The pockets have zippers so nothing will fall out, which is good too! I use it for short and quick trips to the store so I don't have to lug around a purse. This is one of my favorite go-to carriers now. It's so easy to put on, adjust and put the baby in that I wish I had one with my previous two children! Easy adjustable straps and a perfect body fit design provides a seamless experience with getting it on and baby into it. As for getting baby out, it's even easier! Just loosen a few straps (can be done one handed) and lift baby out for easy removal! It takes just a few seconds which is really important. Especially in parking lots in this extremely cold winter we are having in Chiberia! (Chicago). It's the first one Savy Daddy was able to put on and have it fit him really nicely and it's my favorite as well! It's provides us both with a comfortable and safe place to carry around our sweet baby while tending to things that we need to get done. It only takes a few minutes and she is usually fast asleep in it! Thank you Boba for using your ingenuity to come up with a carrier that truly meets all our needs. I highly recommend this for anyone that has babies/toddlers or is expecting! It's a purchase you are unlikely to regret. 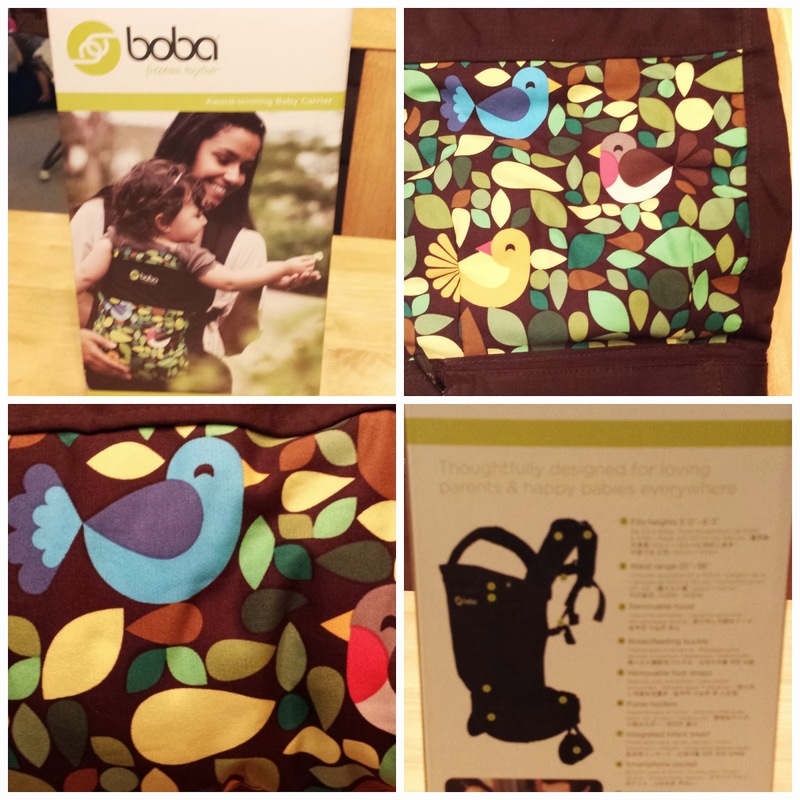 We already pledged our babywearing hearts to Boba after falling in love with the 3G during our review last February (you can find the review here), so we were excited to try out the new and improved 4G! Looks similar to the 3G, right? So, what's new with the 4G? 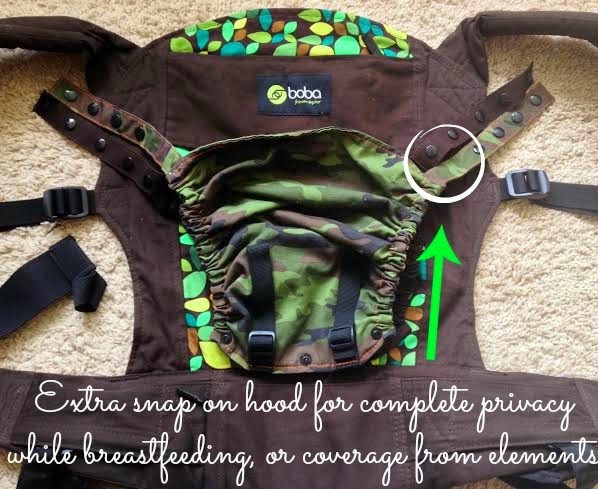 The 4G's upgrades are tailored more-so towards newborns with the integrated infant insert that snaps in and out as well as adjusting for newborns as they grow, but we've found its other features have improved babywearing with our toddler as well. The first thing I noticed, other than the insert, was that they added an extra snap! I'm thrilled to see this! I've told myself over and over again that I was going to add my own snaps to the hood but never got around to it. Looks like Boba beat me to it! With an extra snap, Buddy Doo would've been covered! Believe it or not, the extra arm space intended to improve breastfeeding accessibility has been wonderful with a squirmy toddler as well. He's always wanting to see absolutely everything, so he moves a ton. Sometimes he'll work himself into quite an uncomfortable position for mommy to carry his weight, but with the extra room I can now readjust him quite easily. He's also in this 'I'm a newborn not a heavy toddler so you must hold me all the time!' stage, so its nice having that extra room for him to snack from his snack catcher or sippy in comfortably. This has saved many a grocery trips! I can't wait to try it out with breastfeeding our next. We love our 3G. We love our 4G. We own around 12 different style carriers, wraps, and slings and Boba still wins over for every age and weight range. The versatility, comfort, and freedom it provides has opened so many doors for us to explore as a family, as well as given me a helping hand as a stay-at-home-mom when I'm home alone with our son or needing to run around town. Instead of a carrier that is better suited for one end of the age spectrum or weight range, the Boba 4G captures it all in the only carrier you will ever need uniting quality with affordability. Boba brings freedom together. Here are some fantastic videos to help familiarize yourself with babywearing in a 4G and all the different holds and front/back carry! 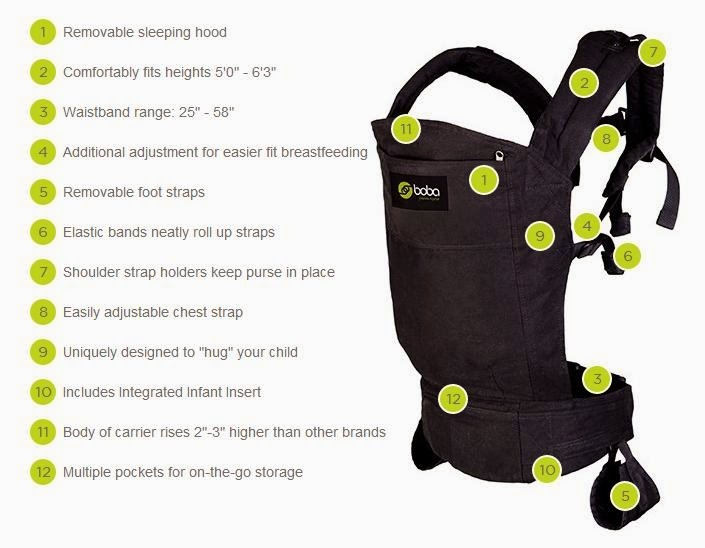 Buy it: Start carrying your baby or toddler with the new Boba 4G for $125. 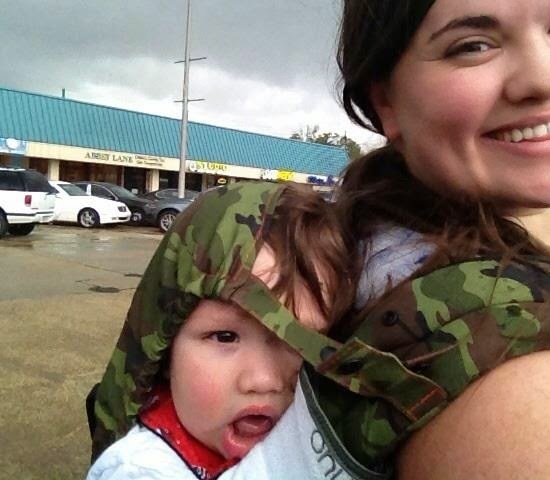 Afraid you won't be able to enjoy babywearing with all this cold weather we're experiencing? Add the Boba Vest ($55) or Boba Hoodie ($70) in your shopping cart! Thank you for this review, we have to pick out a baby carrier soon.